I want to thank Cat Sparks, author of Lotus Blue and contributor to the upcoming Ecopunk! – Speculative Tales of Radical Futures anthology (Ticonderoga Publishing, 2017) for taking time out of her very busy schedule to talk to Eco-fiction about this collection of short stories that she edited with Liz Grzyb. Ecopunk! Speculative Tales of Radical Futures examines how humanity might cope with dramatic changes in nature, and adjust to new versions of normal. Ecopunk! shares stories in which the human race embraces these changes, using innovative technologies and fresh attitudes to make our emerging world sustainable. The stories we have chosen for these pages explore a plethora of possible futures. Our amazing Australian and international authors have blown us away with their powerful, near-future visions, inspiring us with humanity standing strong with optimism and hope. Mary: Thanks so much for joining us, Cat! What is ecopunk and how might it differ from a genre like solarpunk, or are these genres similar? 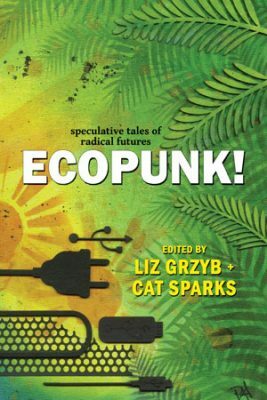 Cat: I think of ecopunk as being a broad slang or colloquial term for climate or Anthropocene fiction, which includes solarpunk and science fiction that deals with ecological themes and the near future–how we might possibly navigate through planetwide challenges. Solarpunk focuses specifically on solar technological solutions and transformations, as the name suggests. Ecopunk leaves the door wide open to sustainable technological developments. Our planet is undoubtedly in crisis–-time to bring all our responses and solutions to the table, no matter how wacky or far-fetched. Science fiction has a long history of inspiring real-world science and engineering. If ever we needed new ideas, it’s now. Near-future science fiction is very good at imagining what might possibly go wrong, highlighting potentials we ought to be afraid of, the dangers and the potential catastrophic outcomes of technological, scientific and even sociological and political trends. Ecopunk has the potential of becoming a contemporary literature of purpose and revolution. Mary: How did this anthology come about? I recognize a few authors in there! Did you receive a lot more submissions than that, and was it hard to select the stories that would appear in Ecopunk? Cat: Ticonderoga Publications put out a call for submissions and the stories chosen were the best of what we received. Liz and I have been friends for years, both active members of the Australian speculative fiction community. We were in Melbourne attending Isobelle Carmody’s extravaganza launch of The Red Queen, the final title in her post-apocalyptic Obernewtyn Chronicles. Most attendees turned up in costume, dressed as characters from the books. Against this lavish background, Ecopunk was spawned! Writing positive stories about the near future is hard–-far harder than writing apocalypse and dystopia. I knew this already from my own writing experiences, yet many talented writers rose to the challenge for this anthology and we ended up having to reject a lot of material. Mary: It’s amazing to see authors these days increasingly explore environmental catastrophe–yet also solutions–in fiction. How important is it to build hope in fiction that deals with disaster? Cat: Fiction needs to incorporate or reflect contemporary cultural concerns in order to remain relevant, no matter whether an author is writing science fiction, fantasy, historical or mimetic fiction. But wallowing in perpetual pessimism and apocalyptic forecast is a cop-out. Nihilism can be dangerously contagious. If authors and other artists perpetuate nothing but doom-and-gloom scenarios, I feel there’s a real risk of hopelessness becoming the default. Cautionary tales are all well and good–-1960s and 70s science fiction abounds with eco-catastrophe, but our real world has passed the point of cautionary tales being enough to affect or influence much needed industrial and societal change. Human industrial activity got us into this mess, and human ingenuity will be put to the test to get us out of it. The interconnectedness of the modern world makes it extremely susceptible to dramatic climate shifts. Many novels feature scientists, either strategically placed to deliver information, investigate or provide explanations for environmental events, or as protagonists effecting change to traditional institutions or ways of thinking. The way we believe in the future is important as it influences the way we behave in our daily lives. Mary: I have recently been talking some with James Bradley, another author from Australia who has explored sustainability, climate change, and other environmental issues in his fiction. Is Ecopunk written entirely from Australia, and what are some unique issues there? It does seem very important to hear from writers all over the world–and see how their localities and perspectives differ in order to put together a literary world view of life in the Anthropocene. Cat: James and I are friends–-we have spoken on many ecologically themed panels together at writing festivals. Most but not all of the stories in our Ecopunk anthology are written by Australians. Australians are accustomed to taking environmental challenges seriously–-we live with them every day. Our country is physically large, yet largely uninhabitable. Civilization clings to the coast. Our homes are threatened annually by fire, drought, floods and heat waves-–and conditions are definitely getting worse. I don’t think any particular country or region has a monopoly on ecological fiction–some places are set to be affected more dramatically than others, but we’re all on the same planet and therefore in this together. Effective stories can reveal what life might feel like when affected by events such as carbon rationing, mass transience, the spread of vector-borne diseases, extreme heat and water shortages; widening chasms between rich and poor; countries overtaken by militant authoritarianism, ushering in a return to brutal religious fundamentalism; barren lands lashed by killer storms; flooded cities; drought-stricken farmlands; increased terrorism; post-catastrophe cityscapes tainted by a breakdown of law and order–with everything played out through characters and their actions, as is the way of all good fiction. Some of these situations might sound more familiar than others and some of them are going to be happening sooner than we might ever dream possible. Mary: Do you think ecopunk, or really any fiction, can help people cope with what’s going on in the world? Cat: Human adaptability is a characteristic of science fiction. Speculative fiction can enable readers to imagine and experience the complexity of our planet in transformation. It can help people accept the fact that climate change is real–no matter what our politicians and industry leaders would like us to believe–and that its consequences will be deadly for many. Extrapolated from scientific data rather than pure imagination, speculative fiction can draw attention to the physical, political, and socio-economic changes that will no doubt be required to mitigate and adapt to the ever-increasing threat of global warming, such as reorientation of economies, government intervention, and changes to mass consumption practices. Personally, I’d like to see more stories challenging the dominance of capitalism, the man-made force that lies at the heart of the problem. It’s vital to change the perception that our Earth abounds with finite, exploitable resources. We cannot keep borrowing from the future like there’s no tomorrow. Science fiction contemplates possible outcomes and serves to highlight fears contemporary society has about itself and where it might be heading. Ecopunk utilizes similar literary plot devices as traditional disaster narratives: historical monuments destroyed, familiar skylines ablaze or drowned and families torn apart. These narratives enhance and emphasize realism by presenting global warming and associated effects as an immediate and verified problem, rather than something that may happen in another place or time, or by accident or the wrath of god. Speculative fiction might not have the answers, but aiming beyond our own interior landscapes is a good place to start. Spec-fic authors are accustomed to plausible world building–those skills can be applied to scenarios on a changing Earth. Mary: Last question, sort of related to the above: do you have favorite nature writers (fiction or nonfiction) who have inspired you a great deal, and why? Cat: A novel that had a great impact on me as a teenage reader was Frank Herbert’s Dune, considered by some to be the first significant work of ecological science fiction. It’s basically a high fantasy Lawrence of Arabia in space with shades of trippy Zen and strong ecological themes. Those Fremen and giant sand worms really rocked my world and pretty much influenced everything I’ve ever written, one way or another. It’s like I never really left the desert. Another was JG Ballard’s The Drought, also published in 1965. Not sure Ballard would be considered a nature writer, but he certainly wrote powerfully and lyrically about the earth undergoing severe environmental stress. Rereading it recently, I was struck by how well it would lend itself to a cinematic version by way of today’s affordable quality digital effects. A three-act play filled with visually interesting characters, many of them female. The landscape of the retreating ocean and salt-encrusted beach. So much contemporary apocalypsia out there, yet this one still stands out by a staunch and jaded mile. As with Dune, whole sequences from The Drought remained firmly embedded in my memory, despite all the many books I’ve read across the decades. Mary: I am also a fan of these novels, and think contemporary visual versions would work well as well. Cat, thanks so much for this chat. I found our interview and background conversations leading to this interview fascinating, and want to wish you the best with Ecopunk, as well as with your studies in this literature. Cat Sparks is a multi-award-winning Australian author, editor and artist whose former employment has included: media monitor, political and archaeological photographer, graphic designer, Fiction Editor of Cosmos Magazine and Manager of Agog! Press. A 2012 Australia Council grant sent her to Florida to participate in Margaret Atwood’s The Time Machine Doorway workshop. She’s currently finishing a PhD in climate change fiction. Her short story collection The Bride Price was published in 2013. Her debut novel, Lotus Blue, was published by Talos Press, an imprint of Skyhorse, in March 2017.